There’s been some discussion recently of the new estimates from Emmanuel Saez and Gabriel Zucman of the distribution of household wealth in the US. Using the capital income reported in the tax data, and applying appropriate rates of return to different kinds of assets, they are able to estimate the distribution of household wealth holdings going back to the beginning of the income tax in 1913. They find that wealth inequality is back to the levels of the 1920s, with 40% of net worth accounted for the richest one percent of households. The bottom 50% of households have a net worth of zero. There’s a natural reaction to see this as posing the same kind of problem as the distribution of income — only more extreme — and respond with proposals to redistribute wealth. This case is argued by the very smart Steve Roth in comments here and on his own blog. But I’m not convinced. It’s worth recalling that proposals for broadening the ranks of property-owners are more likely to come from the right. What else was Bush’s “ownership society”? Social Security privatization, if he’d been able to pull it off, would have dramatically broadened the distribution of wealth. In general, I think the distribution of wealth has a more ambiguous relationship than the distribution of income to broader social inequality. Case in point: Last summer, the ECB released a survey of European household wealth. And unexpectedly, the Germans turned out to be among the poorest people in Europe. The median German household reported net worth of just €50,000, compared with €100,000 in Greece, €110,000 in France, and €180,000 in Spain. The pattern is essentially the same if you look at assets rather than net worth — median household assets are lower in Germany than almost anywhere else in Europe, including the crisis countries of the Mediterranean. At the time, this finding was mostly received in terms the familiar North-South morality tale, as one more argument for forcing austerity on the shiftless South. Not only are the thrifty Germans being asked to bail out the wastrel Mediterraneans, now it turns out the Southerners are actually richer? Why can’t they take responsibility for their own debts? No more bailouts! No surprise there. But how do we make sense of the results themselves, given what we know about the economies of Germany and the rest of Europe? I think that understood correctly, they speak directly to the political implications of wealth distribution. First, though: Did the survey really find what it claimed to find? The answer seems to be more or less yes, but with caveats. Paul de Grauwe points out some distortions in the headline numbers reported by the ECB. First, this is a survey of household wealth, but, de Grauwe says, households are larger in the South than in the North. This is true, but it turns out not to make much of a difference — converting from household wealth to wealth per capita leaves the basic pattern unchanged. 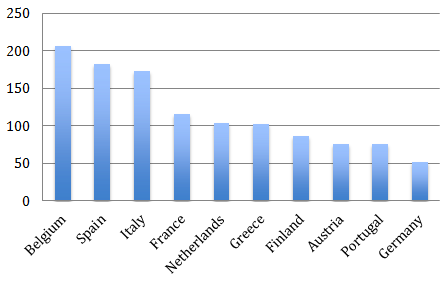 Per capita wealth in selected European countries. From de Grauwe. Second, the survey focuses on median wealth, which ignores distribution. If we look at the mean household instead of the median one, we find Germany closer to the middle of the pack — ahead of Greece, though still behind France, Italy and Spain. The difference between the two measures results from the highly unequal distribution of wealth in Germany — the most unequal in Europe, according to the ECB survey. For the poorest quintile, median net worth is ten times higher in Greece and in Italy than in Germany, and 30 times higher in Spain. This helps answer the question of apparent low German wealth — part of the reason the median German household is wealth-poor is because household wealth is concentrated at the top. But that just raises a new puzzle. Income distribution Germany is among the most equal in Europe. Why is the distribution of wealth so much more unequal? The puzzle deepens when we see that the other European countries with high levels of wealth inequality are France, Austria, and Finland, all of which also have relatively equal income distribution. Another distortion pointed to by De Grauwe is that the housing bubble in southern Europe had not fully deflated in 2009, when the survey was taken — home prices were still significantly higher than a decade earlier. Since Germany never had a housing boom, this tends to depress measured wealth there. This explains some of the discrepancy, but not all of it. Using current home prices, the median Spanish household has more than triple the net wealth of the median German household; with 2002 home prices, only double. But this only moves Germany up from the lowest median household wealth in Europe, to the second lowest. The puzzle posed by the wealth survey seems to be genuine. 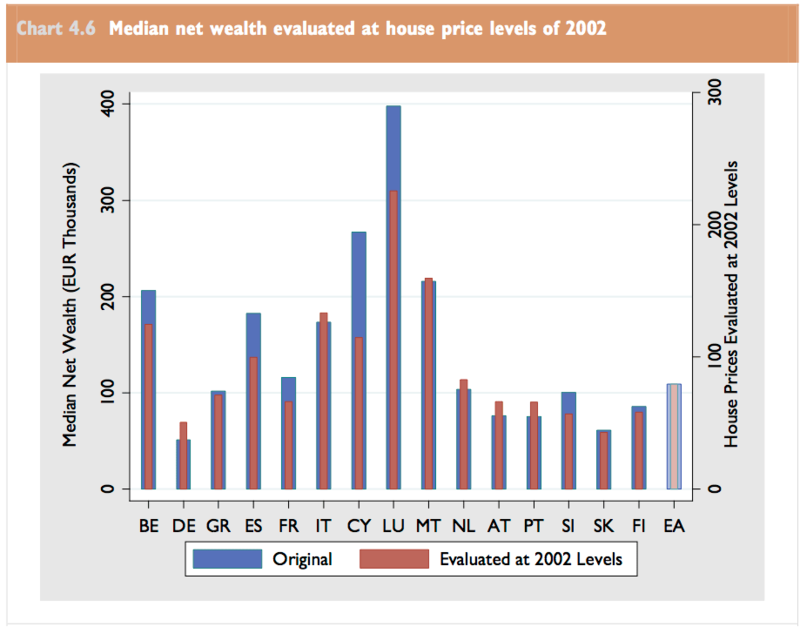 Even correcting for home prices and household size, the median Spanish or Italian household reports substantially more net wealth than the median German one, and the median Greek household about an equal amount. Yet Germany is, by most measures, a much richer country, with median household income of €33,000, compared with €22,000, €25,000 and €26,000 in Greece, Spain and Italy respectively. Use mean wealth instead of median, and German wealth is well above Greek and about equal to Spanish, but still below Italian — even though, again, average household income is much higher in Germany than in Italy. And the discrepancy between the median and mean raises the puzzle of why German wealth distribution is so much more uneven than German income distribution. De Grauwe suggests one more correction: look at the total stock of fixed capital in each country, rather than household wealth. Measuring capital consistently across countries is notoriously dicey, but on his estimate, Germany and the Netherlands have as much as three times the capital per head as the southern countries. So Germany is richer in real terms than the South, as we all know; the difference is just that “a large part of German wealth is not held by households and therefore must be held by the corporate sector.” Problem solved! Except… you know, Mitt Romney was right: corporations are people, in the sense that they are owned by people. The wealth of German corporations should also show up as the wealth of the owners of German stocks, bonds, or other claims on those corporations — which means, overwhelmingly, German households. Indeed, in mainstream economic theory, the “wealth” of the corporate sector just is the wealth of the households that own it. According to de Grauwe, the per capita value of the capital stock is more than twice as large in Germany as in Spain. Yet the average financial wealth held by a German household is only 25% higher than in Spain. So as in the case of distribution, this solution to the net-wealth puzzle just creates a new puzzle: Why is a dollar of capital in a German firm worth so much less to its ultimate owners than a dollar of capital in a Spanish or Italian firm? And this, I think, points us toward the answer, or at least toward the right question. The question is, what is the relationship between the level of market production in an economy, and the claims on future production represented by wealth? It’s a truism — tho often forgotten — that the market production counted in GDP is only a part of all the productive activity that takes place in society. In the same way, not all market production is capitalized into assets. Wealth in an economic sense represents only those claims on future income that are exercised by virtue of a legal title that is freely transferable, and hence has a market value. For example, imagine two otherwise similar countries, one of which makes provision for retirement income through a pay-as-you-go public pension system, and the other of which uses some form of funded pension. The two countries may have identical levels of output and income, and retirees may receive exactly the same payments in both. But because the assets held by the pension funds show up on balance sheets while the right to future public pension payments does not, the first country will have less wealth than the second one. Again, this does not imply any difference in production, or income, or who ultimately bears the cost of supporting retirees; it is simply a question of how much of those future payments are capitalized into assets. This is just an analogy; I don’t think retirement savings are the story here. The story is about home ownership and the value of corporate stock. First, home ownership. Only 44 percent of German households own their own homes, compared with 70-80 percent in Greece, Italy and Spain. Among both homeowners and non-homeowners considered separately, median household wealth is comparable in Germany and in the southern countries. It’s only the much higher proportion of home ownership that produces higher median wealth in the South. And this is especially true at the bottom end of the distribution — almost all the bottom quintile (by income) of German households are renters, whereas in Greece, Spain and Italy there is a large fraction of homeowners even at the lowest incomes. Furthermore, German renters have far more protections than elsewhere. As I understand it, German renters are sufficiently protected against both rent increases and loss of their lease that their occupancy of their home is not much less secure than that of home owners. These protections are, in a sense, a form of property right — they are a claim on the future flow of housing services in the same way that a title to a house would be. But with a critical difference: the protections from rent regulation can’t be sold, don’t show up on the household’s balance sheet, and do not get counted as wealth. In short: The biggest reason that German household wealth is lower than than elsewhere is that less claims on the future output of the housing sector take the form of assets. Housing is just as commodified in Germany as elsewhere (I don’t think public housing is unusually important there). But it is less capitalized. Home ownership is the biggest and clearest part of the story here, but it’s not the whole story. Correct for home ownership rates, use mean rather than median, and you find that German household wealth is comparable to household wealth in Italy or Spain. But given that GDP per capita is much higher in Germany, and the capital stock seems to be so much larger, why isn’t household wealth higher in Germany too? One possible answer is that income produced in the corporate sector is also less capitalized in Germany. Investors who wish to take control of a corporation typically have to pay a large premium to obtain majority ownership. This mechanism might explain why Tobin’s Q tends to be structurally below 1. It can also provide an explanation for some of the cross-country variation… : the higher Tobin’s Q in Anglo-Saxon countries might be related to the fact that shareholders have more control over corporations than in Germany, France, and Japan. This would be consistent with the results of Gompers, Ishii and Metrick (2003), who find that firms with stronger shareholders rights have higher Tobin’s Q. Relatedly, the control rights valuation story may explain part of the rising trend in Tobin’s Q in rich countries. … the ”control right” or ”stakeholder” view of the firm can in principle explain why the market value of corporations is particularly low in Germany (where worker representatives have voting rights in corporate boards without any equity stake in the company). According to this ”stakeholder” view of the firm, the market value of corporations can be interpreted as the value for the owner, while the book value can be interpreted as the value for all stakeholders. In other words, one reason household wealth is low in Germany is because German households exercise their claims on the business sector not via financial assets, but as workers. The corporate sector is also relatively larger in Germany than in the southern countries, where small business remains widespread. 14 percent of Spanish households and 18 percent of Italian households report ownership of a business, compared with only 9 percent of German households. Again, this is a way in which lower wealth reflects a shift in claims on the social product from property ownership to labor. It’s not a coincidence that Europe’s dominant economy has the least market wealth. The truth is, success in the world market has depended for a long time now on limiting dependence on asset markets, just as the most successful competitors within national economies are the giant corporations that suppress the market mechanism internally. Germany, as with late industrializers like Japan, Korea, and now China, has succeeded largely by ensuring that investment is not guided by market signals, but through active planning by banks and/or the state. There’s nothing new in the fact that greater real wealth in the sense of productive capacity goes hand hand with less wealth in the sense of claims on the social product capitalized into assets. Only in the poorest and most backward countries does a significant fraction of the claims of working people on the product take the form of asset ownership. The world of small farmers and self-employed artisans isn’t one we can, or should, return to. Perhaps the world of homeowners managing their own retirement savings isn’t one we can, or should, preserve. Hey thanks! I liked your thing on the FRB/US model. A question. I understand that Germans rent more than most, but ultimately someone still owns the houses (and hence in theory the claim on the future stream) ? So isn't it the same thing as with the corporations? Also, I question P&Z's "where worker representatives have voting rights in corporate boards without any equity stake in the company". Workers may not have a formal equity stake, but their (German) employment contract is a sort of equity (via the implicit longevity of the contract in good and bad times) unlike say Anglo-Saxon one, whee they are more of a subcontractor. The ownership society has one massive problem. It assumes that only the most explicit forms of ownership exists (say shareholding). The world would be a better place if all companies were partnerships. The incentives of partners are long-dated (maximize income across long time) as opposed to shareholders (maximize income now). I highly recommend Timur Kuran's "The Long Divergence". He attributes the decline of Islamic (mostly Ottoman) civilization (relative to the West) to different legal systems. Islamic law facilitated partnerships, whereas western law (first under the Romans, then revived by the Church in the 11th century) facilitated corporations. A major advantage of corporations is that they can be even longer lived than human beings! Admittedly, joint-stock corporations are a specific subset of corporations, but it's a great book. Brilliant analysis. Consistent with research I've seen (I forget where) that showed that high home ownership was associated with low corporate investment – presumably because property is a safe high-yielding investment, whereas corporate investment is much riskier – resulting in generally weaker economic performance. When you say that 50% of US households have zero net wealth, I guess that means that median household wealth for the US is zero so the US would be less wealthy by that measure than any of those European countries? To my mind, those rights to a pay-as-you-go pension should perhaps be included in estimates of wealth. Afterall, an identical system could be concocted where German people held indexed government bonds -the difference would just be a paper destinction. How well did the measures capture the extent of the midsized family owned companies that make up such a large part of the German economy http://en.wikipedia.org/wiki/Mittelstand ? Sorry, I just realized that "The bottom 50% of households have a net worth of zero." does not mean that the median is zero -my stupid mistake! > The two countries may have identical levels of output and income, and retirees may receive exactly the same payments in both. But because the assets held by the pension funds show up on balance sheets while the right to future public pension payments does not, the first country will have less wealth than the second one. Something about this reasoning seems wrong to me. In the second country, I assume that money is paid by someone (the pensioner, the company, whoever) into the fund, which then uses those payments to buy investment assets. In the first country, that money is NOT paid into the pension fund, but is presumably spent by the original holders. If they use that money for consumption, then I don't see how wealth is created. If they use that money to buy *their own* investment assets, don't those assets appear on *their* balance sheet (and thereby contribute to whatever national balance sheet you want to measure)? In the first country, people presumably pay something like a social security tax. The government pays a pension to current pensioners and promises to pay a pension to future pensioners. Those who pay the tax don't get an asset on their balance sheet in return (as they would if they bought a private pension), but they are promised a pension in future. This promise might take the form of a 'trust fund', as in the US, which shows up on the government's balance sheet but not on private balance sheets. I don't think that fixes the issue. I don't think it matters whether the money is invested by the original holders or transferred via a social security tax to recipients. It depends on what those recipients do with the money. If they spend on consumption (rather than investment), then how does wealth increase? In both cases, payments are being made by current workers to an intermediary, who is in turn making payments to retirees. In the one case, the intermediary is a funded pension, the payments by current workers are contributions. In the other case, the intermediary is the state, and the payments by current workers are taxes. In both cases, the same workers are making the same payments to retirees, who are spending it the same way, and in both cases current workers expect to receive retirement income through the system themselves. The difference is that with the funded pension, the future payments are recorded as assets — actually two sets of assets, the households' pension assets, and whatever assets the pension fund holds that give it a claim on the social product to transfer to retirees. Whereas with the government as intermediary, neither current workers' expectation of retirement income nor the claims the government exercises to make payments to current retirees are recorded anywhere as assets. Marris, even if we have private pensions and use our money to buy stocks, that does not neccessarily mean that there is investment. We might just be handing the money over to retirees who are selling their stocks to us and then using the money for consumption. Pay-as-you-go pension systems (such as the major system in Germany) simplify it to being a state administered transfer from working people to retirees without involving asset markets at all. Potentially private pensions also gather corporate profits and add those to the payments to retirees but those corporate profits ultimately have to be paid for by consumers. Say you pay 100 euros social security tax. The government pays 100 euros to a pensioner, and promises to pay you 100 euros in future. That promise is your asset, but you don't include it on your balance sheet. So in this example there is a 100 euro increase in assets, which is not registered on private balance sheets. In reality it isn't necessary for pensions to be funded or 'pre-funded' with social security taxes, but that is the convention. > In both cases, payments are being made by current workers to an intermediary, who is in turn making payments to retirees. This view ignores the investment assets held by the fund. I agree that it's possible to slush funds around so that assets are never liquidated and asset dividends are reinvested, and current pensioners are paid by current payers. If you can stay in that steady-state, it looks like a PAYGO with assets. However, real-world funds don't work that way. They worry about solvency, and part of the way they avoid funding crunches is by liquidating assets. Also, I guess the distinction would be even more stark in a private retirement account, where funds go to by assets which are owned by the account holder. stone's characterization of using these accounts to "revolve" cash from worker to retiree is interesting, but I think it misses the point. The assets somehow got initially funded. And maintaining those assets (not liquidating them) requires that *someone* continue to fund them through time. If the funder changes from the retiree (who sells the assets in his account) to the worker (who buyers the assets in his account), then the company remains funded (in macro). Marris, if I'm not in a muddle about this, the whole point is that the major German pension system is pay-as-you-go WITHOUT assets. "The scheme is based on the Pay as you go (or redistributive) model. Funds paid in by contributors (employees and employers) are not saved (or invested) but are used to pay current pension obligations." Also my last post, looking at a small but rapidly climbing U.S. measure: student loans (and asset-backed securities based on same) outstanding. This is rampant capitalization (emburdenment?) of those students' (presumably college-enhanced) human capital — their ability to produce and earn in the future. Lots more to say but have to run out the door. "Workers' claims as asset owners" vs. "Workers' claims as workers" is an excellent framing, helping me think about this clearly. Thanks again. I'm sure you saw Mike Konczal's piece in The New Inquiry? I find it difficult to believe that the take home message from all of this should be that wealth inequallity does not matter. Germany manages to insulate its own population (for now) from the effects of wealth inequality by having pay-as-you-go pensions, solid employment bargaining and a decent low cost home rental sector -all that is great. BUT the accumulated concentrated financial wealth needs to go somewhere and I fear it warps the global economy. The small numbers Germans who do have large accumulations of financial wealth are just the people who are tapped to buy into the securitized US student loans and NINJA mortgages along with Greek sovereign bonds etc. Doesn't Germany's role as top exporter entail German purchases of the debts of the rest of the world? I don't share any of this complacency about wealth inequality. If I read the OP correctly, his point is not that it doesn't matter, but more that the dollar figure is misleading. All kinds of assets in the German economy are intangible, but they still yield an income. Either directly (pensions), or indirectly (worker representation in companies). This is similar to what often happens in the third world where people can be impoverished, while still seeing their income go up. If I'm driven off the land where I subsist without an income and now am living in a slum where I go hungry (but earn $1 a day) – by conventional economics I'm richer. However in reality I'm poorer. Economics, by focusing obsessively on what can be monetized, misses the larger economy that has not been monetized. Another way to look at it. Wealth is useful for two things: income and power. If I own a pension that gives me an income, but no extra power. If the government guarantees me the same income (*) by taking the same money as taxes, my income is the same. However, by narrow econometric measures I'm poorer than the other guy. Similarly, if rent a house but have the same rights as a home owner and pay the same over the life time in rent as I would pay in mortgage contributions, am I really poorer? Do I have less power? I'd argue no. (*) Actually in practice the government can guarantee a higher income for the same level of contributions, so arguably the guy who owns more 'assets' is poorer in terms of income. "The world of small farmers and self-employed artisans isn’t one we can, or should, return to." I'm really struggling with this. I love France and Europe in general, and I love it largely because they hugely subsidize small farmers and self-employed artisans. The make it possible/easy for those kind of small businesses to get along, and sometimes thrive. Yes, I think I got a bit carried away by the rhetoric there. There are two separate questions being mixed up in that sentence. One is about the evolution of property ownership under capitalism. I'm arguing that while property ownership tend to become more concentrated under capitalism, at the same time the pressure of capitalist competition itself (both between firms and among states in the world market) creates new forms of non-market allocation and non-property claims on the social product. "Joint stock companies as much as cooperative factories should be considered transition forms from the capitalist mode of production to the associated one," as the Old Man says. But this idea that competition itself tends to diminish the role of markets, and make widely-dispersed property ownership meaningless or impossible, is separate from the question of whether smaller-scale organization of production is feasible or desirable. One doesn't want to say there's no connection between the two questions, but they are not the same thing. If you look at total (private + public) debt in Germany and Italy, the two numbers are not that different (though Italy's debt is still higer). This means that in Germany there is much more private debt than in Italy. If, as I believe, in the last decades most countries had to stimulate demand because of some sort of secular stagnation, but some (Italy) used public debt/fiscal stimulus whereas others (Germany) used low interest rate on private loans/monetary policy of sorts, then Italians would look wealthier than Germans, simply because their liabilities are hidden as "public debt", whereas the German's aren't. Look at the percentage of households with debt on page 4 of the ECB survey: 25% for Italy vs 36% for Germany. In theory, this would mean that inflation should be way more popular in Germany than in Italy, but if loan in Germany are indexed to inflation, this might explain whi germans dislike inflation so much, as they fear that prices of stuff and their morgage payments would go up immediately, while their wages not necessariously. I'm not sure this is right. First of all, if you look just at household assets, rather than net wealth, you see a similar story. Second, I think the important thing about Germany is that they did NOT take steps to raise demand, so income growth was lower than elsewhere in Europe. Which in turn is the main factor behind German trade surpluses, as discussed on the blog here: http://slackwire.blogspot.com/2012/11/demand-and-competitiveness-germany-and.html. I lived in Germany for 4 years. What struck me was that everybody RENTS, rather than OWNS their property. The property market is unbelievably slow and stagnant. Prices never rise. Rents never rise. So people are confident they can keep renting all their life – even on their pensions. So you have an established property owning rentier class and a mass market of renters. In the UK or USA, you have the opposite. Every aspirational young couple is desperate to buy a house or apartment. And many people see owning property as the key to a secure retirement. The idea of relying on your pension to pay your rent and living costs seems crazy in the anglosphere. Now this is all anecdote. But I bet property in Germany did not have the bubble that the peripheral countries did. And this may affect the data you are looking at. Revealingly, part of the neoliberalization of Germany in the recent years was push to privatize pensions, supporting asset-based reteirement savings, supporting private home ownership, and liberalizing the housing market. Maybe as a result, at least in some big cities there is now something like a housing bubble driven also by European capital looking for a safe place. So prises are rising, rents too, but very modestly and limitedly compared to other countries. Still, as you say, "people are confident they can keep renting all their life". This is largely due to the fact that the most fundamental welfare policy is guaranteed housing – if you have ever gone on welfare in Germany you'll know that the first thing they do is pay your rent for you. It's a brilliant anti-poverty measure, and the way people in the US have to fear homelessness (even families!) just seems barbaric to me. Many homeowners actually prefer to rent to people on welfare or pensioners, cause their rent is reliably paid by the state. JW Mason name dropped after 40th minute in connection with this piece/post. What's missing from this analysis is Bill Black's fraud factor. Sure, Social Security privatization would have increased the distribution of wealth — until the *scammers* got their hands on it. Just as *scammers* got their hands on various municipal pension plans and 401(k)s and emptied them. Most people are not capable of investing competently enough to avoid scams. This applies to the rent vs. own analysis as well. One reason people in the US are desperate to own rather than rent is that they *expect to be cheated* by the landlords. Wow! It is just a brilliant analysis about the property which showed that high home ownership was associated with low corporate investment – presumably because property is a safe high-yielding investment, whereas corporate investment is much riskier – resulting in generally weaker economic performance. Well property investment is the best way to get a good result. I also invested for the property in Berlin with proper investment strategy and I got my ideal property. I am happy for your nice post and I would like to read more. So keep it up.